Just days after his junior season concluded, K.J. 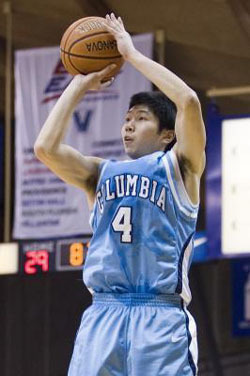 Matsui has already set big targets for his final college basketball season at Columbia University. Matsui was one of the top 3-point shooters in Division I basketball in 2007-08. He made 50 of 102 shots (49 percent) and averaged 7.2 points per game while appearing in 25 games for the Lions, who finished the season 14-15 and 7-7 in Ivy League play (tied for fourth with Yale). Jaycee Carroll of Utah State led all D-I players in 3-point shooting accuracy, making 50.7 percent of his shots (106 of 209). To be eligible for the final national statistics, the minimum requirement is 2.5 3-pointers per game. Matsui fell just shy of that mark, but would’ve been second in the nation if he had made enough shots. He averaged 19 minutes per game, but is expected to see that number rise as a senior. “Since all the seniors left, I need to play a bigger role on the team, such as leading the team and being able to do more things on the court . . . creating my own shots and (for) others and handling the ball,” he said, noting four Lions starters and a point guard have played their final games. 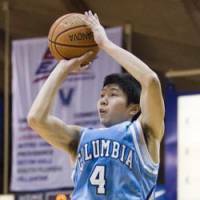 In his three seasons at Columbia, the Tokyo native has established himself as one of the premier marksman in D-I basketball. He’s no longer confused with Godzilla, the Yankees slugger with the same surname. Instead, he’s carved a niche for himself in Manhattan. Matsui was No. 1 on that list, joining Jimmy Baron of Rhode Island, Stephen Curry of Davidson, Shan Foster of Vanderbilt and Pete Campbell of Butler. Looking back at his junior season, Matsui honestly critiqued what he did well and what he can improve upon. To get more playing time as a senior, Matsui knows what’ll be expected of him. The offseason has started. Over the next several months, Matsui will work on his game on his own time. He’ll also participate in individual skill workouts with Columbia’s coaches. “In the summer, I will go back to Japan and work out with some of the players that I know such as Yuta Tabuse . . . and some other pro players,” he said. In June and July, Matsui plans to visit family and friends in Japan. Then he’ll join his Columbia teammates on a 10-day basketball trip to Europe, with games planned in France, Belgium and the Netherlands. Not a bad way to usher in a senior season, eh? I’ll be eager to ask K.J. about the competition in Europe after he gets back. But first I wanted to know how he felt about not being eligible for the final national rankings for 3-point shooters. He responded to my inquiry by saying, “I am not too disappointed. My goal is to win basketball games and lead the team to the NCAA tourney. Matsui’s confidence increased this season, an emotional jolt of momentum he surely wants to carry over to the 2008-09 season. But his focus will be more on the physical aspects of shooting. “Because I shot the ball so well this year, I gained confidence that I can make shots if I get a little bit of space,” he said. “I also have to shoot like this next year because people know now that I can shoot this well. . . .
As March Madness is now under way in the United States, Matsui has temporarily turned his attention away from his own goals to being a full-time hoop fan. He’s predicted Georgetown, UCLA, Memphis and Louisville will reach the Final Four. “I think UCLA’s going to win because they have been there the last two years in a row and they have the most balance from outside, inside, big men and quick guards, and they also play defense very hard compared to other teams,” Matsui said. Those sound like the words of a man with a firm grasp on what it takes to be a successful basketball coach. But K.J. Matsui has one remaining season as a college player at Columbia, a season in which he has a change to leave a special legacy — hopefully one that includes a trip to the NCAA Tournament.